Last updated May 15, 2012. I have to come up with ideas that I can complete on my own. Genetic and physics research probably is more important and in these fields I am running BOINC and Folding@Home. I will appreciate donations. (Not required though, for the free software). Programs that I have created. 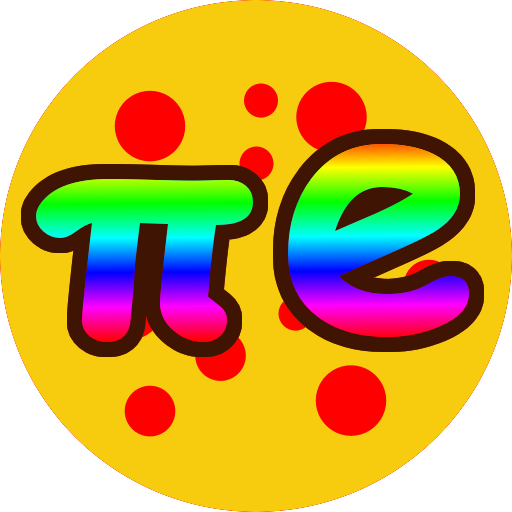 This application generates up to 10000 digits of the mathematical constants π / pi (the ratio of any circle's circumference to its diameter) and e (Euler's number). π is calculated using the Chudnovsky algorithm, which is very similar to some of Srinivasa Ramanujan's formulae involving π. This Java class that calculates the tables in the program: classCalculateTable.txt Explore the 3x+1, x/2 number sequences and make tables of the longest sequences. For instance starting with 7 gives the sequence: 7 22 11 34 17 52 26 13 40 20 10 5 16 8 4 2 1 in 16 steps. Collatz conjecture states that any sequence as the above will eventually reach 1 but that has never been proven. Is it not intriguing that many centuries of development in mathematics can not resolve a problem so easily formulated? The Android application uses a hash table to speed up a little the calculation of tables revealing longer and longer sequences. It can be demoralizing to loose to a computer program. If that also happens to you I can tell you that the programs I make plays better than myself. I now want to begin to work more with Java that runs on many platforms including Windows, Linux and Mac OS, so I have now begun to work with NetBeans from Sun Microsystems. Initially I tried eclipse but I think things works smoother in NetBeans. I have now made a chess program in Java. I have gotten some experience in making board games, making the nine men's morris program, which makes it a little easier to structure the task better from the beginning. I have not made any hashtable in the Chess program yet, but I may do that later. 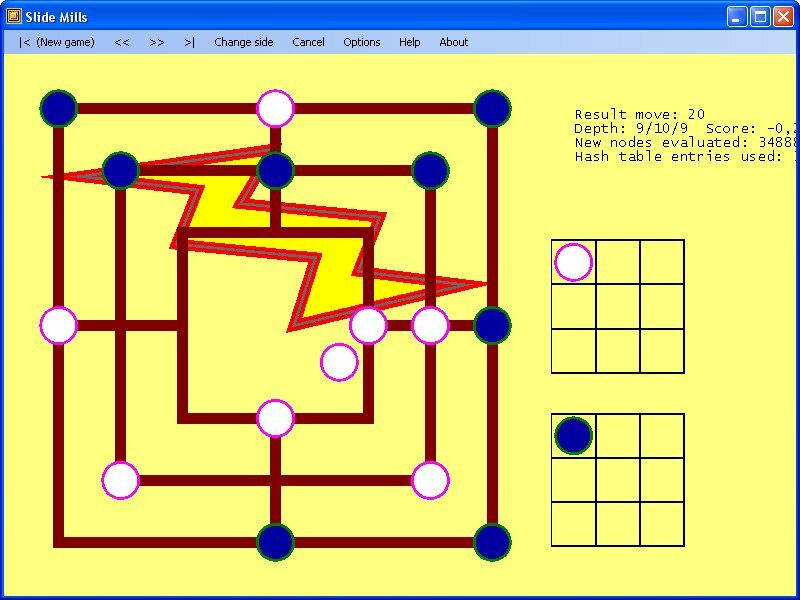 I have programmed the chess rules using bitboards. There is quiescent search to take care of piece exchanges, the program counts the mobility, use piece-square tables and adds small random addition to the evaluation so that the program plays more varied. Now there is also a hash table. There is no king protection and pawn structure evaluation. Adding better pruning of moves and king protection is ideas I have to make the program stronger, this could maybe be done using neural networks and genetic algorithms, which also maybe would attain other tactical advantages. The program is not nearly as good as the best chess programs, maybe its rating is around 1400. Click on the picture to download the zipped Java file, the newest is version 0.28. Unzip the content in the desired folder and run the SimpleChess.jar file to see the result. Because the program is coded in Java it should run on Windows, Linux, Mac OS and other platforms if the Java runtime is installed. The program is free. SlideMills Software Informer: Latest version download, news and info about this Jens Klausen program. I have made a game of Nine Men's Morris. Below is a screen capture of the game. I was going to make the game using a genetic algorithm to find a good fully connected feed forward neural network with 2 hidden layers. It turned out to give a very low playing strength. I have now instead made an implementation using the traditional alpha-beta pruning algorithm and now it plays better, beating most human players including myself. There is also hash table support but no multi processor support. The latest version has updates in the GUI and the pieces can now slide across the board, the user can change the colours of the game as well. The link is to an installation file and Microsoft .NET framework version 3.5 is a requirement for the program to run. This Program is Freeware. You are welcome to download it. It is possible to play a game of mancala against the computer on a difficult level if you set the level accordingly. mancala.zip 1.950 KB. With this freeware program. You are able to play a beta version of Mancala. Not compiled to native code however. Cube.zip 90 KB. The program displays an elastic cube moving around in a bigger solid cube. It's possible to change some parameters on the run. VGA input status #1 register has port address 0x03da for color mode. Bit 3 in this register is 0 during the monitors display phase and 1 during the vertical retrace phase. This Java section is about 10 years old. 1. If you want to develop in Java you can download free software from Sun here: Products & APIs. 2. If your compiled Java applet program consists of name$x.class files that produces a "Permission denied. (Filename ((accept))" error trying to upload, you can use the JAR program, described in The JavaTM Tutorial, to create a nameable jar archive containing the files. Proposition: There are infinite many prime numbers. Proof: Suppose there is only a finite number p1, p2, p3,....,pn of primes. Then a pi that divides N+1=(p1*p2*p3*...*pn)+1 must exist among them. We then have (((N+1)/pi)-(N/pi))=1/pi. But it is absurd that pi divides 1. So our list of primes cannot have been complete. It is however a little more difficult to prove that there are an infinite number of prime number twins. 2 prime numbers pn and pm are twins if pm-pn=2. It has not yet been proven whether there is an infinite or only a finite number of prime number twins. This Java applet is made in 1.1 code if it doesn't run it might do on a newer web browser. The program tests if 2 or an odd number smaller than or equal to the square root of the number divides. The 3*n - 1 number sequences can end up in more than one way. Here is the source code: primfact.java.